While giving keynote speeches and leadership development workshops, I am often asked how to engage employees who work in the most repetitive or boring jobs. In this post, I want to highlight an awesome individual who provides the most telling answer to that question. 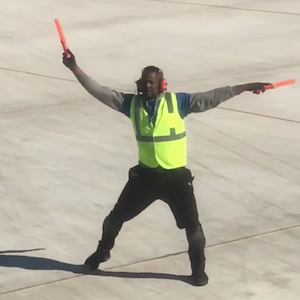 The Tarmac Dancer, as he’s come to be known on social media, is stunned by his sudden viral fame, though for passengers and employees at the Greater Rochester International Airport it’s nothing new. His name is Kyran Ashford, and he’s worked at the airport almost five years. He is employed by JetStream Ground Services, which is contracted by Southwest. Along with his killer moves as an air marshal, he also is known for wearing a giant red-white-and-blue top hat and issuing the boarding instructions to customers as a rap. Kyran said he was stunned that his airport dance went viral, and that he couldn’t help but skip out on sleeping just to see all the positive reviews and comments on the post and across social media. Kyran frequently posts videos on YouTube (though none that have been viewed as many times as Terry McBride’s video) showing him dancing, singing, and even having a relay race against the Syracuse Softball Team. Everyone knows that the airport can be a hectic and uncomfortable place to be, with people worried whether they’ve packed everything they need while struggling to make their flights. For Kyran, his antics are a great way for him to express himself creatively in a job that doesn’t often offer a lot of opportunities for it. And his antics help make an often tough or boring experience memorable and fun for travelers of all ages. For anyone working in a repetitive or seemingly boring job, this is a great example of how to bring your own fun into the workplace. What’s more—a great attitude spreads to colleagues and customers as well. This entry was posted in Blog and tagged employee engagement, fun in the workplace on August 15, 2018 by Kevin Sheridan.